Here at Artisan Cabinet Company, we often talk with homeowners about specialty drawers when helping them plan new custom cabinetry for their kitchens and baths. Homeowners are often surprised to learn that there are so many options to choose from. Many have never considered the possibility that clutter they are accustomed to seeing out on the counters—things like toasters, canisters, soaps and toiletries—can now hide safely away in specialty drawers and cabinets. The result is a clean kitchen or bath that lets your home’s personality shine. We’ve recently added a new gallery of custom drawers to our website. Check it out to get some ideas for your master bath or kitchen renovation. Our kitchens and bathrooms are our most lived-in rooms—and are also some of the most likely culprits for clutter buildup. Adding custom drawer boxes to your kitchen or bath remodel is one of the best ways to reduce clutter, save space and increase the value of your home by giving you the designated areas for hiding things out of sight. We can help you create double-decker drawer boxes that help you easily layer infrequently-used items with items that you use every day. Bread drawers were once a staple in older kitchens, and custom drawer boxes allow you to store bread safely in newer kitchens as well. If you are a wine aficionado, you should definitely consider wine drawer boxes that help you store some of your favorite vintages within easy reach of the kitchen. Spice and knife drawer boxes are great alternatives to spice racks and knife blocks that have traditionally littered kitchen countertops. By adding these custom drawer boxes, you can create usable spaces for storing your spices and knives. In bathrooms, we design custom drawer boxes to wrap around plumbing, allowing you to create more usable drawer space in your vanity. A combination of shallow drawers for small items and deeper drawers for large items can help you organize items that you would prefer to stay hidden, including toiletries, hair dryers and extra bath tissue. Rolling shelves and pullout drawers are also great options in specialty drawers. You can use them in bottom cabinets or in parts of upper cabinets. In master bath renovations, we often recommend the use of custom rolling shelves for jewelry. Pullout drawers are also an option for storing tall items like styling tools and shampoo bottles. What Specialty Drawers Are You Considering? 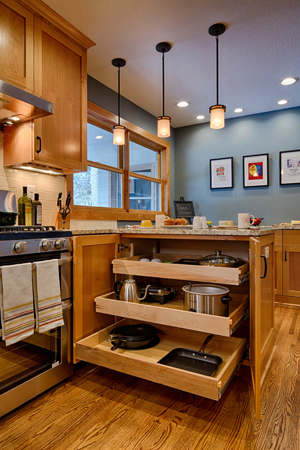 How would specialty drawers benefit your kitchen or bath? Share your ideas here in the comments section, call us at 952-737-7088 or send us an email!